Published on July 22, 2009 in Excel add-ins. 17 Comments Tags: Add-in, Download, Freeware, Generator, GNU GPL, MS Excel, Open Source, Password, Random, Source Code. If this isn’t what you’re looking for, as an alternative, you can visit the online random password generator. 2- Follow the instructions given here for Office 2003 or below, or take a look at the first part of this steps for Office 2007. Fantastic function. I have been racking my brains trying to get this to work. Great – it works. I would like to ask if this is possible to edit content of xlam file – I would like to get some additional knowledge. I would like to ask if it possible to call such ADD-on from macro (how – using Excel_function or how is called this function)? 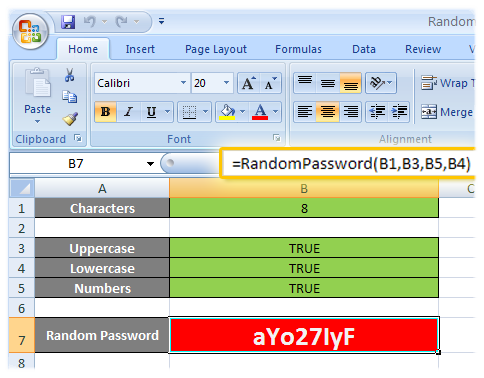 I would like to write macro which will fill all cell in selected range (for each cell in range) typing there generated password. I’ll donate more if possible. Thank you. Wonderful tool, just what I am looking for … for Office 2010! Any suggestions? It goes fine until I have to add the ‘button’ to the ribbon. thanks a lot for your work. I’ve been using this tool for a while. Since I am going to move Office 2010, I wonder if it works with Excel 2010. Your download links are only for 2003 and 2007. What would be a little nicer for the user is checkboxes for the options, so it’s not necessary to type “true” or “false” into all of those cells. Actually it might be even more slick to put it all into a UserForm. Awesome, I was looking for something like this and found it…Thank you. you, my man, are a LIFE SAVER ! brilliant mind ! fabulous function ! They are random. Nothing guarantees the’re unique. If you generate lots of passwords chances are they’ll repeat.